The Millennium Development Authority (MiDA) has earmarked on $10 million to provide safe, quality and reliable electricity to some selected markets and economic enclaves in the country. Dubbed 'Access Project' under the Millennium Challenge Compact (MCC II) power theft also known as 'illegal connections', in markets and Economic Enclaves would be reduced and streamline acquisition of energy meters. Accordingly, 90 per cent of fire outbreaks in the market attributed to electrical wiring would be curtailed under the project. The markets are; Agbgboloshie, Madina, Dansoman, Kaneshie, Makola and Tamale Central. The economic enclaves are the Accra Timber Market and the Tamale Timber Markets. Speaking at a stakeholder engagement meeting on Proposed Interventions in the Markets and Economic enclaves, Mr Samuel A. Afram, Access Project Manager, MiDA noted that the Access Project would commence with engineering design work between April and May this year. According to Mr Afram, implementation of the project was likely to commence in the last quarter of 2018 or early 2019, adding, 'Assemblies are expected to facilitate with the issuance of permits or licence for work to commence in the markets. Mr Afram recounted that aging distribution of transformers, over aged wires and poor wiring have led to inadequate safety in the various markets. He said the lack of compliance of the Ghana National Fire Service (GNFS) requirements and the heating of cooking oils by vendors have also led to fire risks in these markets. Mr Afram said it has been identified that high Pole Transfers ought to be mounted in some of these markets in order to conform to Electricity Company of Ghana (ECG) standards. Mr Samuel Abbey, Project Manager, of ECG said his outfit was enthused about the Access Project as it was going to reduce theft through the provision of security lighting in the markets and ensure reliable power supply. Mr Abbey said ECG was ready to offer the needed technical support since the Access Project aimed at preventing power supply theft and reduce commercial losses. He regretted that power theft had been the order of the day stressing that the company had deployed technology that would prevent people from stealing power. According to him those who would be exposed by the said technology would face the full rigours of the law. He assured stakeholders that ECG would continue to embark on public education to ensure that the Access Project was successful. He said ECG would be ready to provide offices in the various markets to speed up the acquisition of meters. Mr Mawuenya Bubson, Director of Generation Projects, MiDA recalled that the goal of the 498.2 million Ghana Compact II project was to reduce poverty in Ghana through sustainable economic growth with focus on ensuring adequate and reliable power supply. Mr Bubson said one of the objectives of the Compact II was to increase private sector investments and profitability of micro, small, medium and large-scale businesses and raise earnings of all. According to Mr Bubson increased lighting would contribute to a safe work environment and promote social inclusiveness and gender responsiveness in electricity service delivery. Ms Mercy Naa Afrowa Nee Djan, President of the Greater Accra Market Associations, appealed to traders to assist in the smooth take off of the Access Project. She indicated the rewiring of the markets would curtail 90 per cent of market fire outbreaks and requested that each trader be provided with one meter. 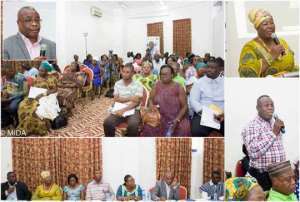 Stakeholders included officials from the Accra Metropolitan Assembly, La Nkwantang, Madina Municipal Assembly, ECG, executives and leadership of Economic Enclaves and market associations.